If you’re serious about lotto, I wouldn’t recommend BoxLotto. BoxLotto is unlike most lottery sites—and that’s no compliment. You won’t find a single official lottery here, so don’t expect to play Powerball, Mega Millions and the like. Instead, they offer their own lottery game, one that is completely free to join and is open to US players. While that sounds promising on paper, the truth is the complete opposite. Prizes, for instance, are practically miniscule compared to the mega jackpots offered elsewhere. And if you do win, you may just have to wait a month after you make a claim to get your prize—however small it is. To top it all off, residents from at least 30 countries are prohibited from playing here. So why would you use this site? Well, I personally wouldn’t—but if you’re interested, read on to learn more! BoxLotto only offers one lottery game—their own. Don’t expect to find games like US Powerball, Mega Millions, and the like here. BoxLotto only offers one lottery game—and it’s not even an official game. The game they offer is their own, but the winning numbers, as I’ve mentioned earlier, are pulled from the latest NY State Lottery results. It also works like most lottery games do: pick 6 numbers and 1 bonus number. On its own, it’s alright—but compared to other lottery games, the prizes are downright unimpressive. The largest amount that you can win is $250,000 (that is, if you match all 6 numbers), while the smallest prize is 3 free tickets. Those prizes aren’t the least bit enticing—especially when there are so many other choices out there. Technically, they do have other games on their site, but I wouldn’t recommend you play them. Okay, let’s get this one out of the way: you can play US Powerball at BoxLotto. 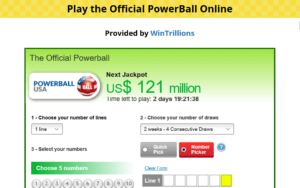 I know, I said that they only offered one lottery game, so why is there US Powerball on their site? Well, it’s not actually “theirs” per se; rather, it’s from WinTrillions. So, why would I play it at BoxLotto when I can go to WinTrillions’ website, instead? At least there are more options and features there. Why play Powerball here when you can go to WinTrillions, instead? 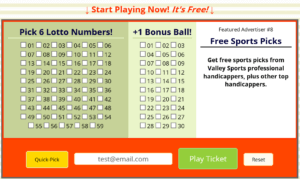 Meanwhile, if you want something a bit more interactive, BoxLotto also offers virtual bingo. However, unlike other sites that feature interactive games, you can’t win actual money here. You only receive virtual currency to purchase in-game items. It’s nothing more than a neat time-waster. Some people might find withdrawing their winnings a bit of a hassle here. Since BoxLotto’s lotto game is completely free to play, you don’t need to worry about deposit methods. You do, however, need to worry about the withdrawal process as BoxLotto only pays through PayPal and nothing else. If you don’t use PayPal, you will have to create an account to receive your winnings. The thing is, if you’re new to PayPal, you will only be able to withdraw your money after 21 days. So, not only will you wait a month to get your winnings, you might also have to wait a bit if your PayPal account is brand new. That’s nearly two months of waiting! At the very least, BoxLotto’s website is safe. Since BoxLotto runs a completely free service, they don’t really need to encrypt data coming to and from their website. However, I ran them through Norton Websafe and Google Safe Browsing to check how they fare and they passed with flying colors. They also got a 100/100 over at Webutations, which is great. Due to the nature of their website, it’s not surprising that customer support isn’t the best. You won’t be able to contact them via phone, live chat or direct email—only an online contact form is available. Plus, they can take up to 2 business days to respond to your inquiry. Their FAQs, meanwhile, lacks some details. For instance, if you want to learn how to claim your prize, they don’t really give you a concrete answer. The quality of their support options pale in comparison to other lottery sites, but, again, it’s expected of a completely free service. Don’t expect in-depth education materials here. Outside of a simple guide on how to play their lottery game (as well as an “Official Rules” page), BoxLotto does offer any in-depth lottery education materials. Sure, they don’t need to given the simplistic nature of their service, but it would have been nice to see to at least get a lottery glossary. BoxLotto’s website is, for the most part, easy to use—but it isn’t pretty. 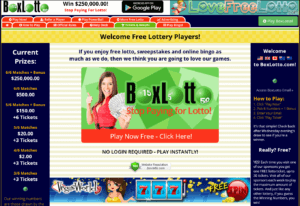 BoxLotto’s website is outdated and littered with ads. If you remember websites made in the early 2000’s, that’s exactly how BoxLotto’s website looks and feels like. The design is outdated, and—not surprisingly—littered with ads. Sure, it’s still a breeze to browse because of its simplicity, but the overall layout is just ugly. It’s a minor gripe though. Though BoxLotto works differently than other lottery sites, playing is, at least, quite easy. Find and click on any of the three “Play Now” buttons as soon as you land on their website. Choose 6 numbers, plus 1 bonus number. You can also choose the Quick Pick option to randomly select numbers. Enter your email address in the given field. Click on the green “Play Ticket” button. You will then be taken to a page that displays a sponsored ad. Don’t close the window; ads are how they make money so you each player has to view them first to get an entry. Wait for a few seconds until your ticket is validated. Click on the green “Submit Ticket” button that appears. Finding out you’ve won and claiming prizes at BoxLotto seem straightforward, but they’re not without caveats. You can find out if you’ve won either by checking their results page or signing up for an email alert. Seems easy enough. Here’s the caveat: BoxLotto claims they pull the winning numbers from the NY State Lottery to ensure fairness, but they also use a PHP function to randomly generate the bonus ball. Because of this, the numbers could differ slightly from the NY State Lottery results—which could end up confusing some people. Sometimes, the numbers match perfectly, though. Meanwhile, claiming prizes is as simple as checking the results page, entering your email address on the given field, and following the on-page instructions. Don’t expect to see your money immediately though—winnings are paid a month after you make a claim. So, for example, if you made a claim in October, BoxLotto will pay you around the first week of November. Finally, if you win but don’t live in Australia, Canada, Ireland, New Zealand, South Africa, UK, or US, you will not be informed nor will you receive any of your winnings. Countries outside of the ones I mentioned are prohibited from participating in BoxLotto’s game. You can play in more than 1 lottery game! In fact, you can play in 53 lottery games—from the most popular and lucrative, to some obscure ones. You can also play in group play games, or a millionaire raffle. They offer various withdrawal methods. No need to be tied down to PayPal—theLotter accepts over 29 different deposit methods and 7 withdrawal methods. Residents from various countries can play here. Residents from more than 7 countries can use theLotter’s services—though US players are not allowed. Play in popular lottery games and more! WinTrillions offers a good mix of games: 20 single play lotteries, 13 syndicates, 8 millionaire raffles, and 4 raffle syndicates. They have excellent banking methods. Forget about being forced to use one payment method, WinTrillions allows you to use any of the accepted 32 payment methods. Prizes are deposited to you in a timely manner. Prizes less than $600 are automatically deposited to your account, while winnings beyond that are handled on a case by case basis. They can also assist you to expedite the process. LottoKings offers various game types. You can choose from the 19 single play games, 4 syndicates, and a few millionaire raffles. Claiming your winnings is a breeze. Like other lottery sites, winnings below $600 will be automatically deposited to your account. Unlike some other lottery sites, however, LottoKings can claim prizes that go beyond the threshold on your behalf. Their accepted banking methods are slightly limited. Sadly, LottoKings only accepts 10 payment methods. That’s still a lot compared to BoxLotto’s though. The Bottom Line – Should You Use BoxLotto? No—but there’s no harm in checking them out. There are a lot of reasons why you shouldn’t use BoxLotto. However, given the free nature of their service, it wouldn’t hurt to enter their game as it is a good idea to pair this with an actual official lottery entry elsewhere. Of course, that is if you live in the countries that are allowed to play here. If you aren’t—and I suspect many of you belong in this category—then it’s absolutely pointless to visit their website. BoxLotto is an online lottery site based in California and owned by Audie Johnsen. They offer a completely free lottery game with payouts as high as $250,000—made possible by support from various sponsors.